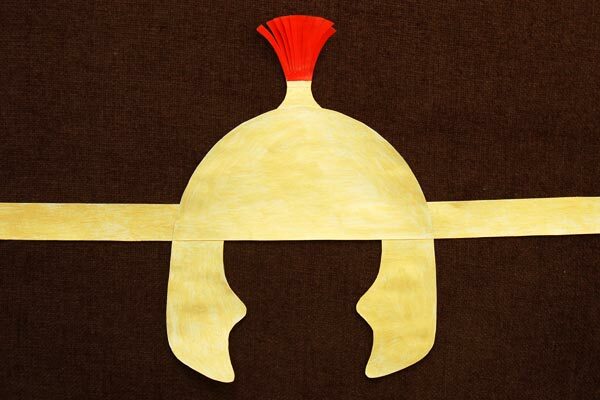 Print out, color, and assemble our template into a wearable paper Roman Imperial helmet. 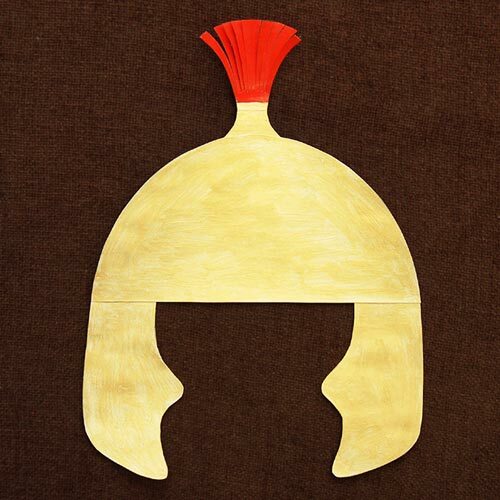 Wear it for Christmas pageants, Easter plays, or whenever you need a quick Roman soldier costume. 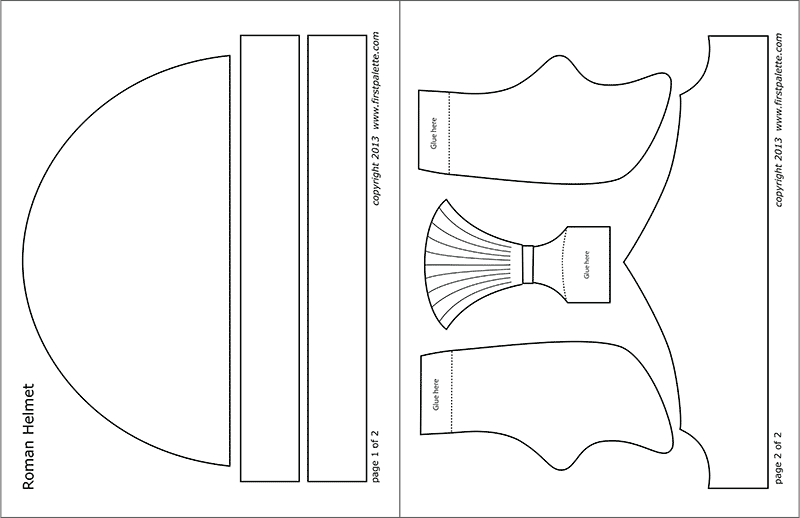 Choose from any of these Roman Imperial Helmet templates. 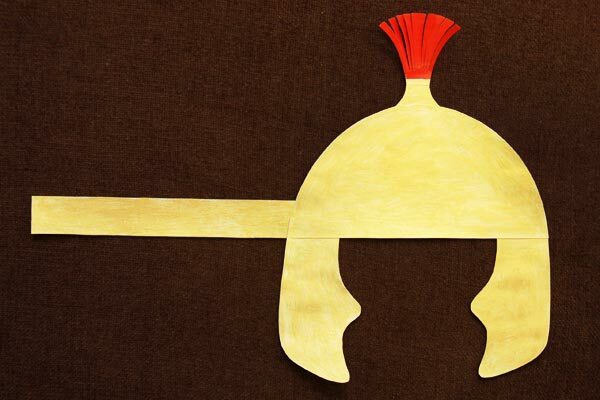 For this craft tutorial, we chose the plain template to demonstrate the basic steps for making a paper roman helmet and the various ways you can decorate it. If you prefer a quicker and simpler option, you can print out the ready-to-color template or the colored helmet template. 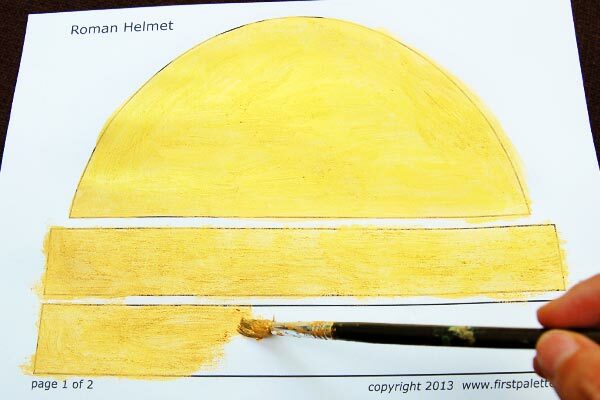 The first page consists of the main helmet piece and a pair of long straight bands. 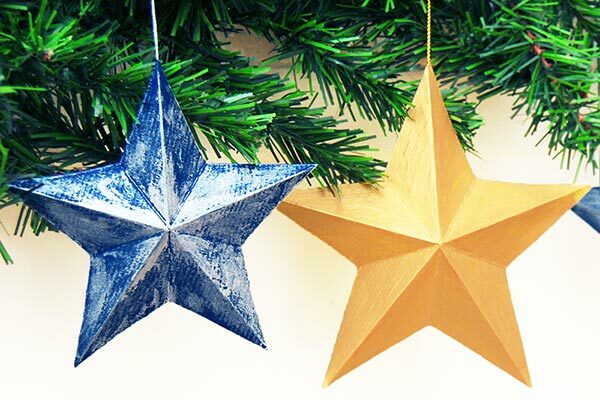 Paint the pieces with a metallic color such as gold or silver tempera, poster, or acrylic paint. Instead of painting, you can can also color the pieces with crayons or oil pastels. 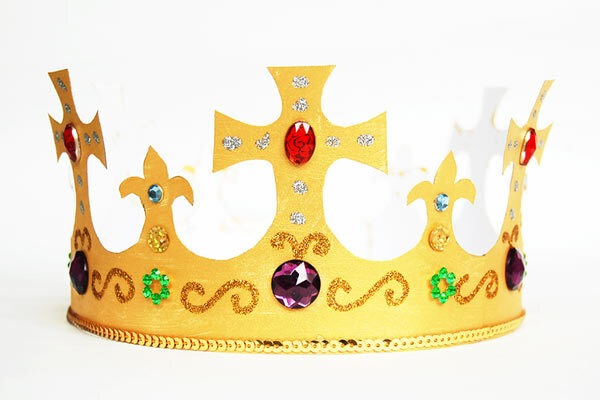 The second page includes a crown-like visor, a pair of curvy cheek guards, and a crest. Paint all of these with gold or silver paint except for the top part of the crest. 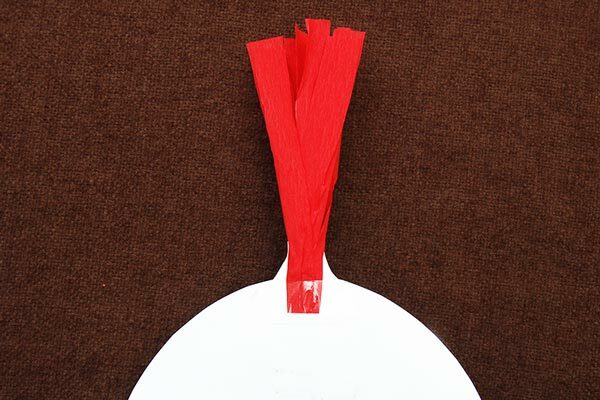 Paint the fan-like portion of the crest red. Also notice that the cheek guards and the crest have tabs labeled with the words "Glue here". Leave these tabs unpainted. Once the paint dries, cut out all the template pieces. 4Cut fringes on the crest. Take the crest. Cut slits following the inside lines to create fringes. Apply glue on the crest's bottom tab. Glue the tab behind the top portion of the main helmet piece. Glue the pair of cheek guards onto the bottom corners of the helmet. The top tab of each cheek guard must be positioned behind one bottom corner of the helmet. 7Glue one band on the left. Next, glue one straight band behind the helmet's bottom left corner. Align the band's bottom edge with those of the helmet's. 8Glue the other band on the right. Glue the second straight band onto the helmet's bottom right corner. Glue each corner of the visor close to the junction between the straight band and the helmet. This will cause the visor to slightly pop out, breaking the flatness of the helmet. 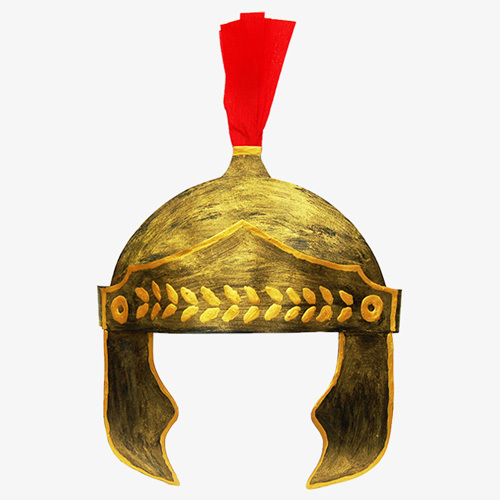 This step completes a basic Roman helmet. To wear the helmet, simply join the bands together to fit around your head. 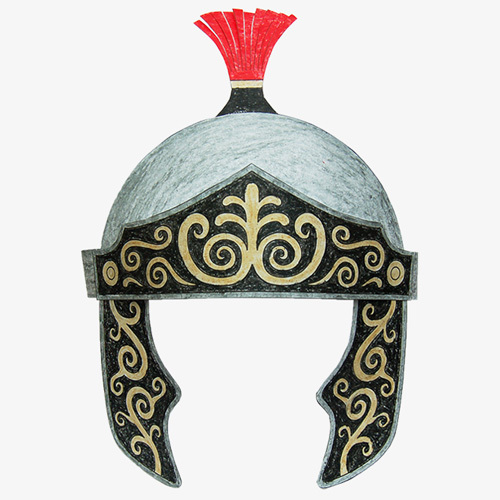 In case you want to embellish the helmet, continue with the steps below. 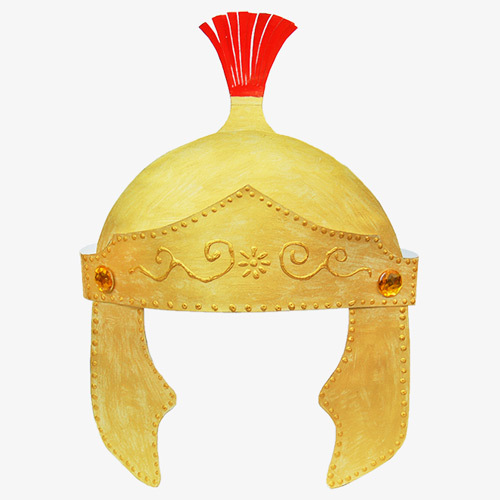 Use glitter glue, puffy paint, or colored glue to decorate the helmet with embossed lines. 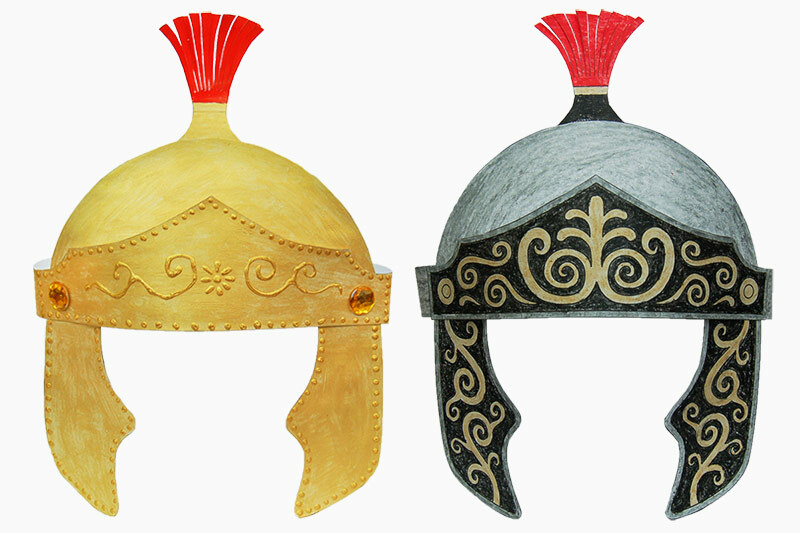 Scrolls, curvy lines, leaves, flowers, and dots are elements often found in Roman helmets. You can also glue on plastic gems, sequins, or gem-style stickers for added texture. 11Create a pair of rivets. Glue on a pair of large plastic gems, buttons, or round paper cut-outs to create the "rivets" on each corner of the visor. 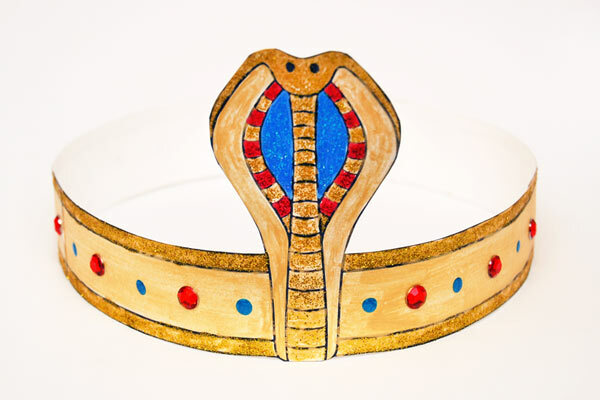 You can also draw the rivets using glitter glue, puffy paint, or colored glue. Once everything is dry, glue or staple the ends of the bands together to fit around your head. Accent the helmet with other colors. 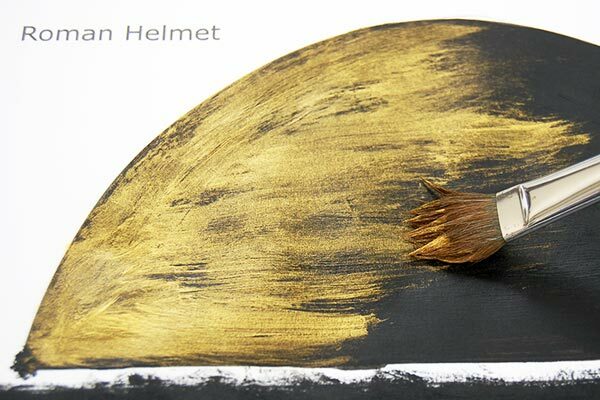 In addition to gold or silver, color the helmet with black, brown, and other metallic colors to create accents. 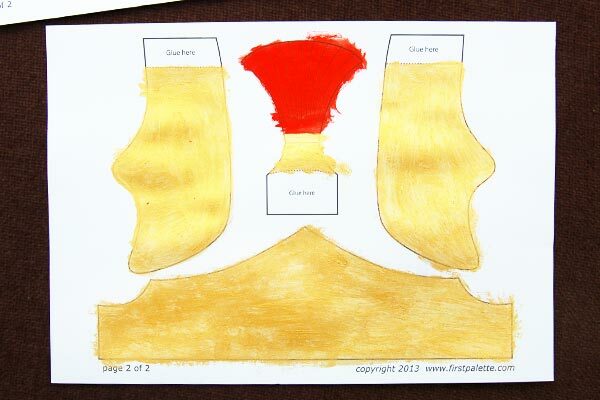 Achieve a worn or ancient effect by painting the templates with two layers of paint. First, paint all the pieces with a base color such as black or dark brown. Once dry, apply a second layer of gold or silver paint using dry brush strokes so that the base paint partially shows through. 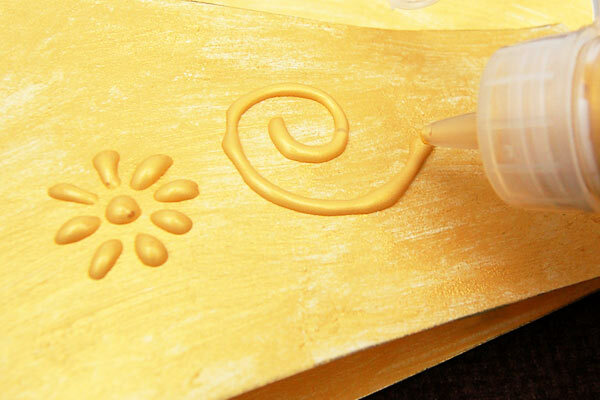 To do this, dip the tips of a dry paint brush onto gold or silver paint. Apply onto the helmet in quick uneven strokes. 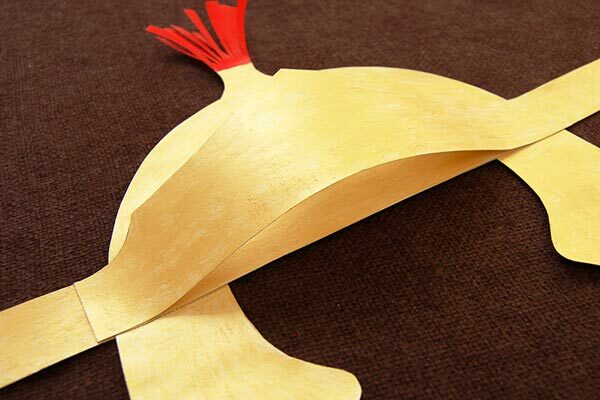 Make a crepe paper crest. 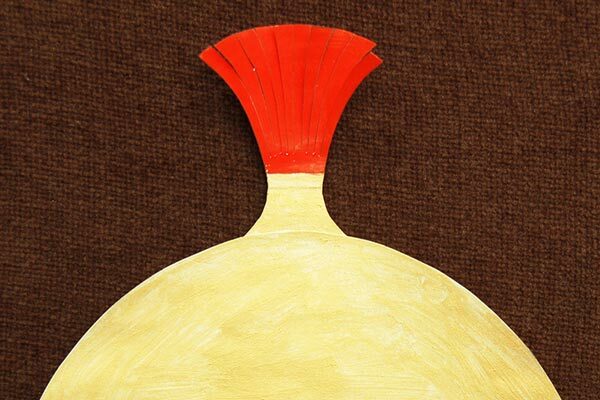 Create an interesting crest by trimming off the fan-like crest on the template and gluing on some red feathers or a rolled-up piece of red crepe paper. 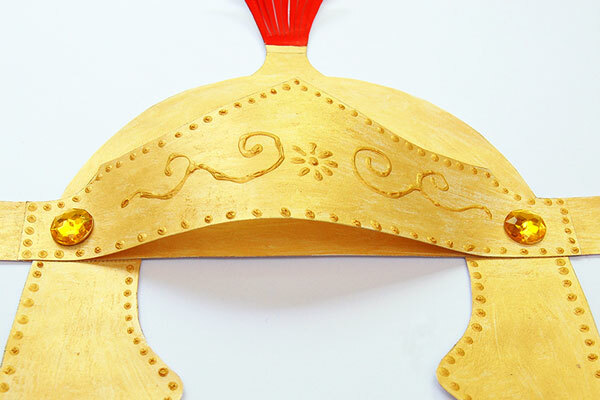 The steps for making a crepe paper crest are described below. 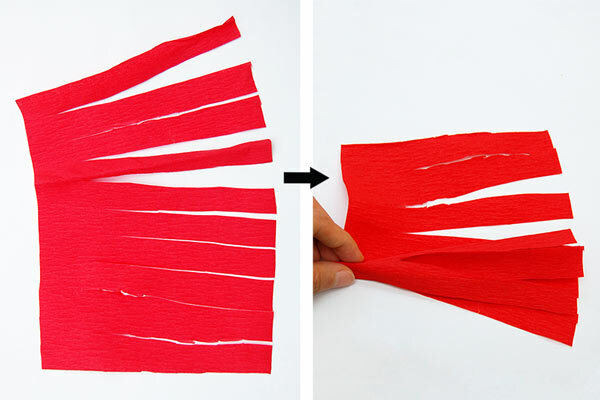 To make a crepe paper crest, cut out a rectangular piece out of red crepe paper. Mine is around 6 x 5 inches. Cut evenly-spaced slits starting from one long side and stopping about 1 to 1½ inches from the opposite side. 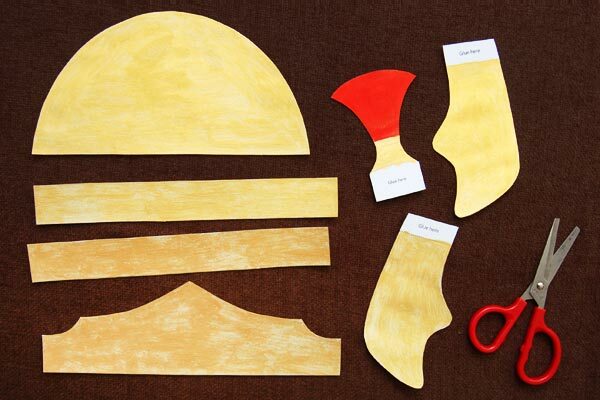 Continue until you've cut slits along the entire length of the crepe paper. 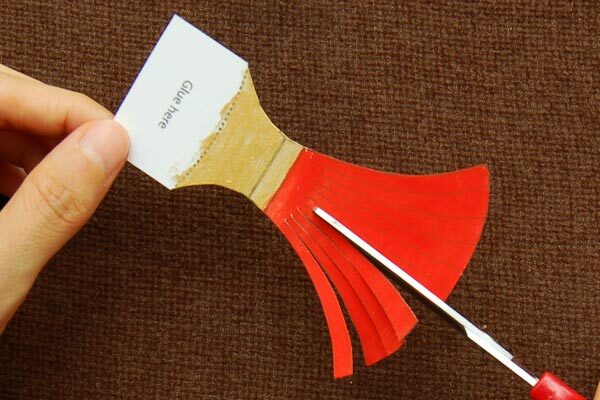 Hold the crepe paper on one corner of the uncut edge. Carefully roll the entire piece. Tape the base of the crepe paper crest at the back of the helmet's topmost portion.